DALLAS, Texas - Space entrepreneur, Jim Benson, head of Benson SpaceCompany of Poway, California is set to announce a fresh approach in the design of hisfirm?s ?Dream Chaser? space tourism vehicle. A five month-long study bySpaceDev and Benson Space Company (BSC) has determined that this new designwill provide ?the first, safest and best astronaut-making spaceflights for theemerging space tourism market.? The announcement is slated to occur during theNational Space Society?s International Space Development Conference that getsunderway here this week. This new design is deemedsafer and more aerodynamic, Benson said. It will also allow Benson SpaceCompany to remain on schedule to make its initial commercial spaceflights in2009. 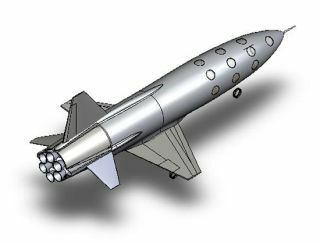 The new Dream Chaserspaceship design is lighter and sleeker, Benson is reporting, resulting in lessdrag and requiring less propulsion than the earlier HL-20 design. The vehicle is to bepowered by safe hybrid rocket motors, will launch vertically, followed by glideto a landing at the launch site. A safer ?carefree reentry? --after achieving an altitude of at least 65 miles ? Benson reports, will subjectpassengers to minimal G-forces, compared to other designs. It will also havemany large, well-placed windows for ideal passenger views of the Earth andspace during the suborbital trek. While thenew design is safer and more aerodynamic, Benson noted, it will also be easierand faster to construct, allowing BSC to remain on-schedule to make its initialcommercial spaceflights in 2009. The aim is to provide the first, safest andbest astronaut-making spaceflights for the emerging space tourism market, headded. ?During thepast two months a small, highly experienced team has taken a fresh look andconcluded that we can do better,? Benson noted in a press statement. ?To thatend, the new spaceship will incorporate the best elements selected from othersuccessful vehicles. This will result in a spaceship that provides a betterride and even more spectacular views, and at this early stage we will loselittle time in bringing it to the commercial market,? Benson explained. Establishedin September 2006, Benson Space Company seeks to provide the first, safest andlowest cost astronaut-making spaceflights for the emerging personal spaceflightmarket. BSC is currently developing Dream Chaser spaceships -- based on provendesigns ? that the firm anticipates will allow them to offer the world?s first,commercial, suborbital spaceflights. NOTE: Theviews of this article are the author's and do not reflect the policies of the NationalSpace Society.